A Jordanian man says his 4-year-old niece is fighting for her life after being wounded in the New Zealand mosque shootings. Sabri Daraghmeh said by phone from Jordan on Saturday that the girl, Elin, remains “in the danger phase” and that her father, Waseem — Sabri’s brother — is in stable condition. The Daraghmehs are of Palestinian origin, but have Jordanian citizenship, like several others listed as Jordanian nationals among those killed and wounded in the mosque attacks. The Palestinian Foreign Ministry said Saturday that at least four Palestinians were among those killed, but acknowledged they could have been counted by Jordan or other countries. A few hundred demonstrators have protested the New Zealand mosque shootings outside Istanbul’s Hagia Sophia — a Byzantine-era cathedral that was turned into a mosque and now serves as a museum. There have been, however, increasing calls for Turkish President Recep Tayyip Erdogan’s government to convert the structure back into a mosque. Pakistan’s foreign minister says at least six Pakistanis were killed in the New Zealand mosque shootings. Shah Mahmood Qureshi says authorities in Christchurch, where the shootings took place, are trying to determine whether three other Pakistanis who have been missing since Friday’s attack were among the fatalities. At least 49 people were killed in the attacks on two mosques. Turkey’s president says authorities are investigating the movements and possible contacts in Turkey of the man suspected of attacking two mosques in New Zealand. Recep Tayyip Erdogan also demanded that New Zealand ensure that the perpetrators of the attack be punished. State broadcaster TRT says the suspect, Brenton Tarrant, visited Turkey twice in 2016 — on March 17-20 and Sept. 13 to Oct. 25. The station has released a security camera image of him arriving at Istanbul’s Ataturk Airport. Tarrant reportedly visited a number of countries, including Bulgaria last November. Three Turkish citizens were injured in Friday’s attack in Christchurch, which killed at least 49 people. The number of Jordanians killed in the New Zealand mosque shootings has risen to four after a man died of his injuries. Jordan’s Foreign Ministry announced the death Saturday. Five other citizens were wounded and are receiving treatment. The ministry has not released the names of the victims. At least 49 people were killed in the mass shootings Friday at two mosques in Christchurch. Bulgaria’s chief prosecutor says the suspect arrested in the New Zealand mosque attacks traveled to the Balkan country last year. Sotir Tsatsarov confirmed late Friday that Brenton Tarrant had been in Bulgaria from Nov. 9 to Nov. 15. He said Tarrant rented a car and toured more than a dozen cities, visiting historic sites. He said Tarrant was mainly interested in battles between Christians and the Ottoman army. The prosecutor said an investigation has been launched into whether Tarrant had contacts with local citizens. The Interior Ministry said Bulgaria is coordinating with counterterrorism teams from various countries, including the United States. Egypt says four Egyptians were among those killed in the New Zealand mosque shootings. The emigration ministry said Saturday that authorities in New Zealand have confirmed the deaths of the four Egyptians, including two 68-year-olds. The ages of the other two victims were not given. A total of 49 people were killed in the mass shootings Friday at two mosques in Christchurch. Australia has banned right-wing commentator Milo Yiannopoulos from touring the nation over his social media response to the Christchurch mosque shootings. Coleman didn’t specify the comments he was referring to. Lawmakers within Australia’s conservative government had been quarreling in recent weeks on whether the firebrand commentator should be allowed to tour Australia this year. The number of Jordanians killed in the New Zealand mosque shootings has risen to three after a wounded man died of his injuries. Jordan’s Foreign Ministry announced the death Saturday. The ministry said a Jordanian diplomat is on his way to New Zealand to coordinate with local authorities. In the immediate aftermath of Friday’s attack on two Christchurch mosques, the Foreign Ministry had announced that two Jordanians were among the 49 people killed, and that eight Jordanians had been wounded. Jordan has not released the names of Jordanian victims of the attack. An Australian senator who sparked outrage for blaming Muslim immigration for the New Zealand mosque shootings has been hit on the head with a raw egg. Television cameras caught a 17-year-old boy breaking an egg on the independent senator’s head and briefly scuffling with Anning while he was holding a news conference Saturday in Melbourne city. A police statement said the boy was arrested but was released without charge pending further enquires. The attack at two mosques in Christchurch killed 49 people. 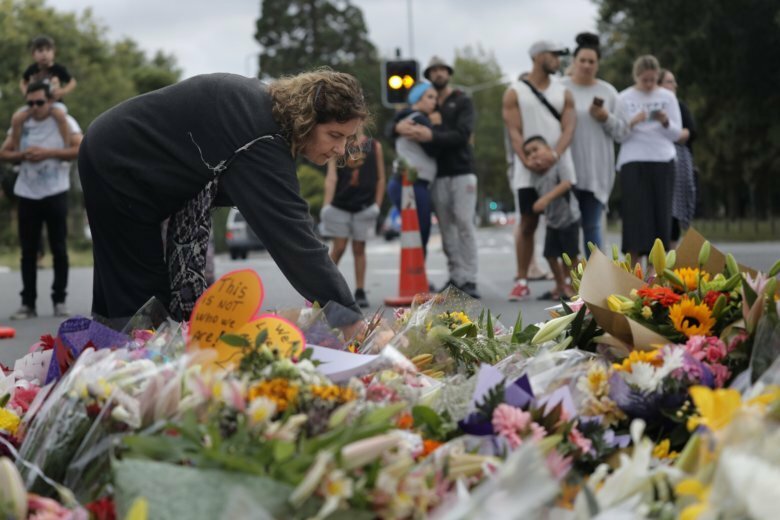 People across New Zealand are reaching out to Muslims in their communities and around the country the day after mass shootings at two mosques that left 49 people dead. As a 28-year-old white supremacist stood silently before a judge on Saturday, New Zealanders everywhere volunteered acts of kindness. Some offered rides to the grocery store or volunteered to walk with their Muslim neighbors if they felt unsafe. In other online forums, people discussed Muslim food restrictions as they prepared to drop off meals for those affected. Brenton Harrison Tarrant appeared in court amid strict security and showed no emotion when the judge read him one murder charge. The judge said more such charges would likely follow. Friday’s slaughter was streamed live on Facebook and took place during midday prayers. A Super Rugby match between the Christchurch-based Crusaders and the Dunedin-based Highlanders has been canceled in the wake of the shootings at two mosques that killed 49 people. New Zealand Rugby spokesman Nigel Cass said the decision to cancel Saturday’s game in Dunedin was made after an urgent meeting involving both teams, venue management and police. Cass said police advised that the game could go ahead but both teams agreed to not proceed with the match as a mark of respect. The Crusaders are the defending champions in Super Rugby, a competition that involves teams from New Zealand, Australia, South Africa, Japan and Argentina. Christchurch Hospital chief Greg Robertson says seven of the 48 gunshot victims admitted after Friday’s mosque shootings in have been discharged. Roberson says a 4-year-old girl who has been transferred to an Auckland hospital in critical condition and 11 patients who remain in Christchurch are also critically wounded. He says many patients will require multiple operations to deal with their complex series of injuries. New Zealand police commissioner Mike Bush says authorities have no information about any imminent threats in the country but everyone should continue to be vigilant in the wake of mass shootings at two mosques. Bush said it took 36 minutes from the first attack to the suspect’s arrest. The gunman posted a 74-page manifesto on social media in which he identified himself as Tarrant and said he was a 28-year-old Australian and white supremacist who was out to avenge attacks in Europe perpetrated by Muslims. Australian police say the family of the suspect in the New Zealand mosque shootings is helping their investigation. New South Wales state Police Commissioner Mick Fuller says his officers are investigating to help New Zealand police and to ensure the safety of residents in the Australian state where suspect Brenton Tarrant is from. Fuller says Tarrant’s family is from the northern New South Wales town of Grafton and contacted police after seeing media reports of the shootings that killed at least 49. Fuller says Tarrant has spent little time in Australia in the past four years. Willing says there’s no information to suggest any further threat in New Zealand or Australia. A man suspected in at least one of the shootings that killed at least 49 people at two mosques in New Zealand has appeared briefly in court. Two armed guards brought Brenton Tarrant into court Saturday. He showed no expression as District Court Judge Paul Kellar read one charge of murder to him. The court appearance lasted only about a minute and he was led back out in handcuffs. He was ordered to return to court again April 5. This item has been corrected to show the suspect appeared in court Saturday. There was strict security at the district court in Christchurch, awaiting a court appearance by a suspect in the killing of at least 49 people at mosques. Authorities say most if not all were killed by an immigrant-hating white supremacist. More than 10 armed officers guarded the courtroom even before the suspect entered. Nearly 50 reporters packed the courtroom in downtown Christchurch. Only a pool video and still camera were allowed in the room. There did not appear to be any victims’ family members there. New Zealand’s prime minister says the “primary perpetrator” in the killing of at least 49 people in two Christchurch mosques was living in Dunedin, a seaside city south of Christchurch. Prime Minister Jacinda Ardern said Saturday the Australian suspect has traveled around the world and spent sporadic periods in New Zealand. Police say homes around a “location of interest” in Dunedin have been evacuated as a precaution. Two improvised explosive devises were found in a suspect’s car. At least 49 people were shot to death at the mosques. Authorities say most if not all were killed by an immigrant-hating white supremacist. He will appear in court on Saturday charged with murder. Ardern says police are still investigating whether two more suspects who were arrested were directly involved in the crimes. New Zealand’s prime minister says the “primary perpetrator” in the mosque shootings was a licensed gun owner and legally acquired the five guns used in the shootings. Jacinda Ardern said Saturday the country’s national gun laws will change after at least 49 worshippers were shot dead in the two mosques in Christchurch. She did not specify how the laws will be changed. The Australian suspect will appear in court on Saturday morning. President Donald Trump is downplaying the threat of white nationalism in the aftermath of a self-described racist’s shooting rampage at a pair of New Zealand mosques. Trump spoke in the Oval Office Friday, answering “I don’t, really” when asked if he felt that the racist movement was a rising threat around the world. An immigrant-hating white nationalist killed at least 49 people gathered for weekly prayers in a live-streamed attack. Another 48 people suffered gunshot wounds. A man who can’t find out information about what happened to his father and two brothers in one of the New Zealand mosques that were attacked has pushed through police barricades in an effort to get closer. Mohammed said Saturday that he has repeatedly called cellphones for his relatives that rang unanswered and then appeared to have run out of battery power. He says he has not heard from his father and brother since Friday, when they went to the mosque. Mohammed says he had planned to join them for prayers but did not because an appointment he had with a lawyer about buying a house went late. At least 49 people were shot to death at the mosques. Authorities say most if not all were killed by an immigrant-hating white supremacist. The Frenchman who coined the term “the Great Replacement” used as the title of the alleged manifesto by the New Zealand mosque attacker says his theory is “diametrically opposed” to the bloodbath at the mosques. Camus held firm to his notion that immigrants are replacing natives in France and elsewhere. He says it is a “changing of the people” that should be combated with what he calls “re-immigration” and not with violence. Camus is 72 and developed his theory 20 years ago. The term has been used more recently by French politicians opposed to immigration, notably far-right leader Marine Le Pen. Christchurch’s mayor says graves are being dug for the dozens of worshippers who were shot dead in two New Zealand mosques. At least 49 people were slain during midday prayers Friday. Mayor Lianne Dalziel says city officials on Saturday were working closely with the community on the specific requirements of a large number of Muslim funerals. A senior Turkish official says the suspect arrested in the New Zealand mosque attack travelled to Turkey multiple times and spent what the official called an “extended period of time in the country. He says the suspect may have also travelled to countries in Europe, Asia and Africa. The official spoke on condition of anonymity in line with Turkish government rules. He did not say when the suspect travelled to Turkey. — By Suzan Fraser in Ankara, Turkey. President Donald Trump is pledging “any assistance” the U.S. can give New Zealand following deadly shootings at a pair of mosques. Trump tweeted that “we stand in solidarity with New Zealand” after speaking with Prime Minister Jacinda Ardern. At least 49 people were shot to death at two mosques in Christchurch, New Zealand, during midday prayers Friday. Officials say nine Indian nationals or people of Indian origin are missing after the mosque attacks in Christchurch. Indian officials have not said whether the nine were believed to be living in Christchurch.